Catham Сity is steeped in intrigue and deceit — corrupted officials, bribed cops, lying journalists… One must have the thick fur and sharp claws to survive here, in this dump, and even prosper. Here, each day is a choice between gaining a support of different groups or turning your clandestine resources against your rivals. 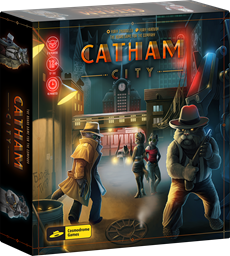 Catham City is a fast-playing thematic card game, where the players race to collect enough influence to become the new underground boss of Catham. Each turn, a player choses one of two possible actions - play cards from hand to earn influence, gain more cards and even mess up opponent plans or take stack of cards to his hand from the market area. The game contains 8 different decks of cards, each with unique ability and art, but you use only five each play.